For the VERY low price of this mp3, you can save hundreds, even THOUSANDS of your hard-earned dollars!!! Those who can afford it the least, play lotteries the most. People with incomes below $10,000 per year play the lottery 3 times as much as people with incomes over $50,000 per year. Out of the 15 million people who have some sort of gambling addiction, 65 percent of those addicted to gambling commit other crimes to support their habit. One in five pathological gamblers attempts suicide – that is 20 times higher than that of non-gamblers. Access to gambling is easier than ever before. There are now 260 casinos on Indian reservations and more than 100 Internet gambling sites for sports alone. The number of states with lotteries is up to 37. This easy access has propelled gambling revenues to $30 billion worldwide, with $17 billion on lotteries each year. Can hypnosis really beat these odds? In a word, yes! There are signs and symptoms that indicate you could have a problem with gambling and could benefit from hypnosis. If you are missing work or other responsibilities in order to gamble, you are at serious risk of gambling addiction. Also, if gambling is your method of escaping problems or is causing problems in a relationship, then it is at a serious addiction level. Finally, if you find you must continue gambling no matter if you are winning or losing then you need to get help before it destroys you. The Stop Gambling Compulsion Hypnosis MP3 download taps into the strengths and abilities within you to help you overcome detrimental behaviors. 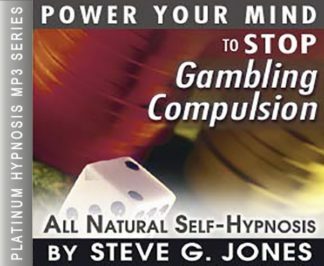 Clinical hypnotherapist, Steve G. Jones, unleashes those abilities in his program, Ending Gambling Addiction by helping you relax so your inner ability to quit gambling has a more dominant role than the addictive behavior. Are you going to get lucky NEXT time? Are you going to BEAT THE HOUSE? Have you developed a ‘system’ that CAN’T LOSE? and they’re waiting for you to come back. unless you end your gambling addiction. DO SOMETHING FOR YOURSELF TODAY…END THIS ADDICTION ONCE AND FOR ALL…BEFORE IT ENDS YOU !!!!! Steve G. Jones, Ed.D., Clinical Hypnotherapist, charges $1,500 for a custom recording and $25,000 for a one-hour private hypnotherapy session at his office. But you can get all the benefits for this low price. 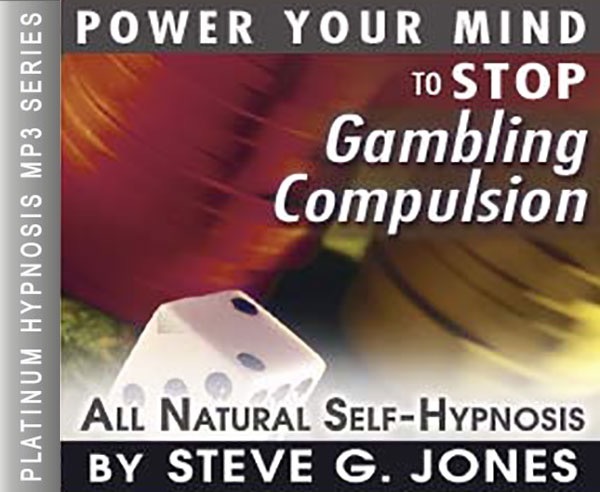 Simply listen to the Stop Gambling Compulsion Hypnosis MP3 audio every night as you go to bed for three weeks and feel the changes happening in your life. You will feel more empowered, more in touch with your true self, and you will truly know that your goals are within your reach. Steve G. Jones achieves AMAZING and LASTING results!!! Hypnosis is the easiest way to affect change in your life because the positive messages go straight to your subconscious mind effortlessly so you can accomplish your goals and reach for the stars!! All you have to do is listen to the Stop Gambling Compulsion Hypnosis MP3 recording at night as you go to sleep!!! You’ll hear soft music, the gentle sounds of the beach, and the soothing sound of Steve G. Jones’ voice all working together to bring about positive changes in your life easily and naturally. Steve G. Jones has been helping people improve their lives with hypnosis for over 17 years…now it’s time for him to help YOU… don’t wait, do it NOW !!! you’ll be glad you did. See you at the top! You are relaxed now and because you are so relaxed you begin to feel free from all tension, anxiety, and fear. You now realize that you are more confident and sure of yourself because you have taken the enormous first step toward helping yourself. You begin to feel this strength from within, motivating you to overcome any and every obstacle that may stand in the way of your happiness, your social life, and your home life. You will find that from this moment on you are developing more self control. You will now face every situation in a very calm, relaxed state of mind. Your thinking is very clear and sharp at all times. You begin to feel that your self respect and confidence are expanding more and more each and every day in every way. You now realize that in the past gambling was an escape and weakness that you are replacing with confidence, strength, and self control. Gambling was an escape and weakness that you are replacing with confidence, strength, and self control. You are becoming a happy person now with a positive attitude toward life. You are succeeding now and you have all the abilities for success. You no longer need or want to gamble. Gambling addiction is a very serious addiction that is not to be taken lightly by the person who is addicted or by family and friends. Gambling addiction is like any addiction, such as addiction to nicotine, drugs, or alcohol. It is a difficult habit to break, but hypnotherapy will help you break the habit once and for all. A person who is addicted to gambling will constantly feel the need to gamble to make money or to recoup a loss. When they win, this fuels the addiction to keep playing to win more. When they lose, they feel pressure to keep playing to make up for the loss by hopefully making more. Unfortunately a gambling addict is eventually going to lose and usually they lose big time. This can have a major impact on finances and relationships. If you or a loved one is addicted to gambling, then they must get help. Hypnosis is a natural and effective method to use to combat gambling. Hypnotherapy will help re-program your brain to no longer get the gambling high, so you no longer gamble. The Stop Gambling Compulsion Hypnosis MP3 recording will replace your addiction with feelings of confidence, motivation, and self-control. You are in control. Hypnotherapy will give you the control to no longer gamble. After listening to this Stop Gambling Compulsion Hypnosis MP3 session for 21 days, you will no longer feel the need to gamble. This one recording can dramatically improve your life by helping you eliminate gambling from your life. Steve G. Jones has helped countless people overcome their gambling addiction and he has helped them focus their energy on more productive goals. This hypnosis session will do so much for you and your well-being. We encourage you to seek help in the form of hypnosis so that you can get rid of gambling in your life.